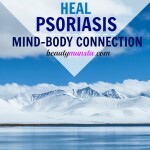 How to Heal Psoriasis Naturally with Herbs - beautymunsta - free natural beauty hacks and more! Psoriasis, an autoimmune disease characterized by scaly, itchy, dry, red/white patches on the skin, is one of the oldest skin conditions to be recorded. The word psoriasis comes from the Greek word psora which means ‘to itch’. Various treatments were used throughout history to treat psoriasis until today’s commercial psoriasis creams, light therapy and topical steroids. Out of all these treatments, the safest ones that really work to cure psoriasis are herbs and essential oils. 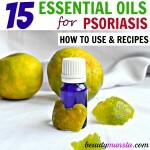 Find out the best essential oils to treat psoriasis and recipe in this post. Commercial psoriasis treatments including creams and topical steroid treatments can only provide temporary relief to dry itchy and inflamed patches and may come with serious side effects such as skin thinning, rashes, changes in pigmentation, easy bruising, redness and dilated surface blood vessels, among others. Not to mention, prolonged use of these topical treatments & applying them to widespread areas of skin, can affect internal organs because 60 % of what we apply on our skin goes directly into the blood stream. Long ago, people used herbs to make herbal drinks and ointments that would soothe a range of skin conditions. Ancient Egyptian scrolls described the making of a salve with various herbs that would be spread all over the skin after which the person would be instructed to sit under the sun to bring relief to psoriasis symptoms. Caution: Please consult your doctor/healthcare professional before using any of these herbs to heal your psoriasis. If you are pregnant, breastfeeding or have any chronic conditions/allergies, avoid using any of these herbs before consulting your doctor. 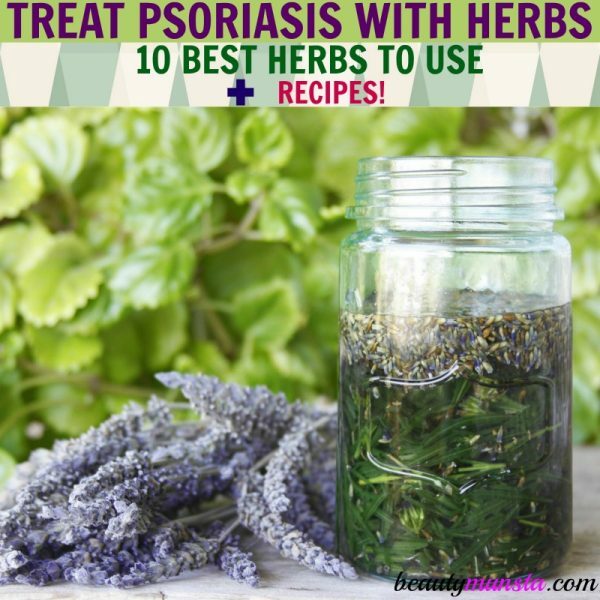 Here are the 10 best herbs to heal psoriasis naturally plus homemade recipes and DIY topical treatments you can make at home to effectively manage dry itchy psoriasis. The name skullcap comes from the Latin word scutella, a small dish or tray which is in reference to the appearance of the flower’s sepals during the fruiting period. This powerful herb was used by the Cherokee for the treatment of a number of ailments including women’s problems, kidney disorders and diarrhea. 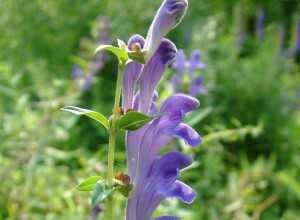 Due to its strong antioxidant and anti-inflammatory properties, skullcap is one of the best herbs for psoriasis. It helps soothe inflammation, reduce itching and calms redness. 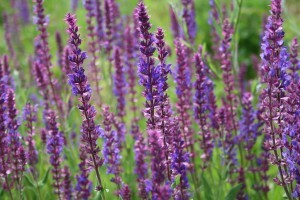 ► Healing Blend: Fill a mason jar 1/2 full of dried skullcap and fill to the top with extra virgin olive oil. Add 2 tsp of vitamin E oil. Stir with a chopstick. Cover with a lid and set the jar on a sunny windowsill or outside in the sun for about 2 weeks to infuse. 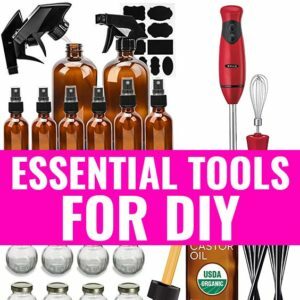 Massage the oil all over your body before a shower or bath. Aloe vera is popularly used in skin, beauty and first aid care products because of its soothing and healing properties. The history of aloe vera in skin care goes back more than 5000 years. It was used to treat a myriad of skin conditions including burns, dry skin, itching, sores, rashes and many more. For healing psoriasis naturally, aloe vera can either be ingested or applied topically. Its skin soothing and cooling properties calms inflammation, cools red & irritated skin and reduces itchiness. ► Cooling Aloe Vera Gel Treatment: In a small mason jar, add 3 ounces of aloe vera gel and 5 drops of tea tree essential oil, 5 drops of lavender essential oil and 5 drops of geranium essential oil. Mix well with a spatula. Store in a clean dry place. Apply on the affected skin for instant relief. ► Anti Bacterial Turmeric Mask: Mix 1/2 cup of oatmeal flour, 1-2 tsp of turmeric powder and enough water to create a paste. Slather this paste all over the affected skin. Leave it on for at least 20 minutes before taking a bath/shower. ► Psoriasis Clearing Detox Drink: In a glass of tepid water, mix in a tbsp of organic raw apple cider vinegar, 1 tsp of lemon juice, 1 tsp of raw honey and a pinch of cayenne pepper. Take once/twice a day between meals. Being a powerful anti-inflammatory, milk thistle is said to help reduce inflammation and also slow down excessive cell growth. 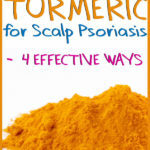 The key ingredients in this potent herb that help control psoriasis are a group of compounds known as silymarin. 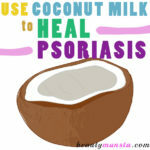 Taking milk thistle tea is an effective way to naturally heal psoriasis. ► Milk Thistle Tea: Boil one cup of water on the stove. Remove from heat and steep one milk thistle tea bag for 10 to 15 minutes. Add natural sweetener of choice such as maple syrup. Strain and sip up! 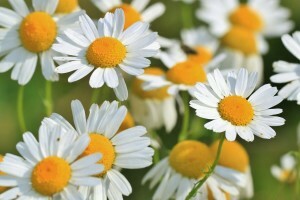 ► Cooling Chamomile Cream: Soften (don’t melt) 3 ounces of raw shea butter in a double boiler. Once softened, add 10 to 15 drops of chamomile essential oil and 5 drops of peppermint essential oil. Using a hand mixer, whip till you get a fluffy white mixture. Transfer to a small mason jar. Apply to affected areas to soothe and moisturize. Slippery elm, derived from the inner bark of the tree, gets its name from its slippery/mucilage component. 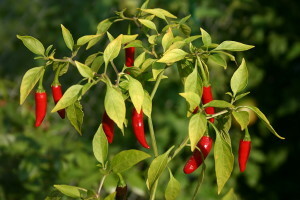 It was used by the Native Americans since ages ago to treat burns, boils and other skin injuries and conditions. Slippery elm bark tea is recommended to be taken in the morning before breakfast (3) for the treatment of psoriasis. ► Herbal Tincture: In a cup of hot water, add 1/2 tsp or 1 tsp of slippery elm powder and stir well. Native Americans used wintergreen leaves to treat many ailments including sore throats, respiratory problems, headaches, fever, tooth decay, rheumatism, joint problems among others. Wintergreen essential oil is also used externally as a folk remedy to cure disorders such as psoriasis. ► Soothing Salve: In a small mason jar, place 3 ounces of raw cocoa butter and place the jar in a pan filled with a couple of inches water. Heat over low flame until the raw cocoa butter softens. Remove from heat and add 7 drops of wintergreen essential oil and 6 drops of lavender essential oil. Mix well with a spatula. Leave it to harden for 3 hours. Apply on affected areas. Evening primrose oil, extracted from the seed of the evening primrose plant, is a natural home remedy for psoriasis. It is rich in omega 6 fatty acids and contains GLA, which is a particular type of omega 6 fatty acid that is known to be effective against itchy skin conditions such as psoriasis. Evening primrose oil has powerful anti-inflammatory properties and reduces skin redness. ► Massage Oil: In an amber glass bottle, add 1/2 cup of jojoba oil, 1 tsp of vitamin E oil and 10 drops of evening primrose oil. Shake well. Using a dropper, apply a little to the affected areas and gently massage for at least 3 minutes. Also known as ‘female ginseng’, dong quai is a powerful herb which has been used in Traditional Chinese Medicine for over 2000 years. Although most popularly known for treating female problems, dong quai also helps heal psoriasis. According to Medscape, by consuming dong quay and then receiving ultraviolet light therapy or natural sunlight, patients are self-administering a form of psoralen-UVA (PUVA) therapy (4) , which is effective in the treatment of psoriasis. Note: Since this herb is said to be very potent, please refer to your doctor before using it. Lavender is an herb that is popularly known for its skin soothing properties. It’s antibacterial and antiseptic properties soothe burning, inflamed and itchy psoriasis patches. Relaxing baths can be prepared using lavender, oatmeal and dead sea salt bath bags. In a clean cheese cloth, wrap a handful of dried lavender, steel cut oatmeal and dead sea crystals. Drop this into your hot/warm bath water and squeeze to soften it. Soak in the milky water to soothe and soften scaly skin. ► Lavender Infused Coconut Moisturizer: Dried lavender can be steeped in a carrier oil such as fractionated coconut oil and let to steep in the sun for 2 weeks. After two weeks, the infusion can be strained into an amber glass pump bottle and used as a moisturizer or massage oil. (1) Ellis CN, Berberian B, Sulica VI, et al. A double-blind evaluation of topical capsaicin in pruritic psoriasis. J Am Acad Dermatol. 1993;29:438-442. Is Shea Butter Good for Psoriasis?